You can find many IT services companies in Dallas and Houston. Many of these firms provide solutions based on the latest big data analytics technologies and visualization methods. We are proud to be a local big data solution provider in these localities. Here’s our list (in alphabetical order) of capable and experienced community members, who provide big data solutions in the Dallas and Houston metro areas. Together, we can make east Texas a hub of advanced data science capabilities. Alert Logic (Houston): With more than a decade’s experience pioneering and refining secure, flexible cloud solutions, Alert Logic designs solutions to work with hosting and cloud service providers. Their complete solutions live in the cloud but are rooted in real-life knowledge and experience. ARGO (Dallas): ARGO Financial Services automates software operations to improve customer experience and solve real problems faced by financial institutions. For more than 30 years, ARGO has provided the financial services industry with mission-critical solutions based on the latest best practices. 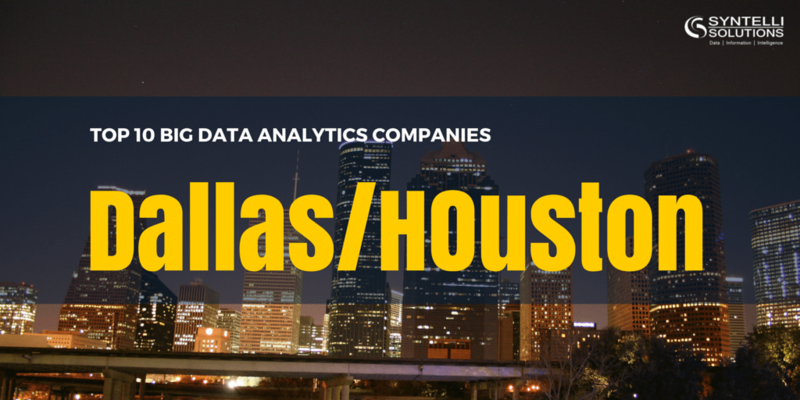 Buxton (Dallas): Buxton is a leading provider of data analytics-based customer growth solutions. By integrating customer data, location data and analytics, the company’s SCOUT tool provides users with on-demand answers to business questions. ClearVision CRM (Houston): The experience of key individuals drives and maximizes the success of your CRM and BI projects. ClearVision CRM delivers more than 20 years’ experience in consulting, outsourcing, system integration and offshoring across a wide variety of industry verticals. Hostspot (Dallas): Hostspot provides brick-and-mortar businesses with a marketing, analytics and communications toolkit. Use it to better understand the habits and preferences of your face-to-face shoppers. Mede/Analytics (Dallas): A pioneer in healthcare analytics, Mede/Analytics has always had a simple goal: improve medical practice by strengthening the business of healthcare. PROS (Houston): Use PROS solutions to outsell, out-market, and outsmart the competition. PROS tools enable you to mine big data, reveal buying patterns and identify attributes that drive customers’ preferences. PROS turns your data into a competitive advantage and provides actionable insights about your markets and customers. Riversand Technologies (Houston): Founded in 2001, Riversand has only one goal: to provide world-class, enterprise software to companies that want cost-effective master data management (MDM) and product information management (PIM) solutions. Socialyzer (Dallas): Socialyzer technology helps you generate more revenue through social media by helping you better understand your audience. Use Socialyzer tools to predict which types of content will perform best, at what time on which social networks. Syntelli Solutions (Dallas and Houston): Syntelli is a data science company that’s not limited to highly technical solutions. They also provide the latest, third-party licenses and manage projects of any size and complexity. Use Syntelli tools, consulting and advisory services to market your offerings or analyze your sales, supply chain or human resource operations. Syntelli partners with makers of big data analytics and visualization tools such as Tableau Desktop, TIBCO Spotfire, and Hortonworks Hadoop platforms.